The The past few weeks have showcased numerous signals that the real estate market is on the rise. Recently, we have reported statistics pointing to an industry turnaround, including a 15 percent rise  in housing starts in September; a surge in builder confidence  in October, an increase in mortgage applications  and a slew of regional market  improvements across the country . A recent Marketwatch story written by Amy Hoak points out that housing markets in the Great Plains, including those in North and South Dakota, Texas, Wyoming, Nebraska, Louisiana and Iowa, are showing the most signs of strength these days, according to a recent report from Veros, a risk management and valuation services firm. Hoak notes that Bismarck, North Dakota., is expected to be the strongest market in the country in the year ahead, with housing values appreciating at a 5.6% clip, according to Veros. Other markets projected to be among the strongest in the year ahead include Honolulu; Fargo, North Dakota. ; Harrisburg/Carlisle, Pennsylvania; and Pittsburgh. Washington, D.C., and Boston remain strong city markets. Hoak writes that while not many markets are fully rebounding, at least a good number of them likely won’t see values fall at quite as rapid a pace as in recent years, according to the report. 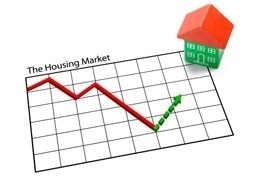 “Overall, the recovery in the housing market is limited to just a few markets and is taking a long time to occur. The encouraging news is that many markets are no longer expected to be rapidly declining,” says Eric Fox, vice president of statistical and economic modeling for Veros. The weakest U.S. markets are in Nevada, inland areas of California, Washington and Oregon, according to the report. The weakest market in the year ahead: Bakersfield, California, where foreclosures have been a huge problem. Hoak wraps up the story with words of assurance; While prices aren’t on the upswing in many places, at least they’re not expected to fall that rapidly in the coming year. RISMedia welcomes your questions and comments. Send your e-mail to: realestatemagazinefeedback@rismedia.com .